Building Innovation 2019: Why Sponsor or Exhibit? This month, two groups have launched centers of excellence in additive manufacturing (known as 3D printing) aimed at accelerating R&D, standardization and innovation in that field. Global standards developer ASTM International launched its Additive Manufacturing Center of Excellence with Auburn University, NASA, manufacturing technology innovator EWI and the UK-based Manufacturing Technology Centre (MTC). In addition, Auburn and NASA formally launched the National Center for Additive Manufacturing Excellence (NCAME). Building Innovation 2019: The Institute’s Seventh Annual Conference and Expo gives companies and organizations the unique opportunity to gain exposure and show off their solutions to the most diverse industry audience. Representatives from all disciplines will attend this annual event to work together to explore strategies aimed at Optimizing for Tomorrow. 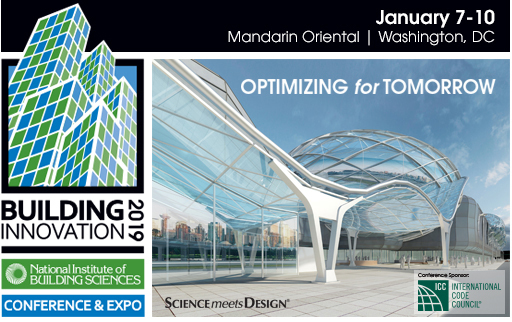 Opportunities are available to sponsor one of several events during the four-day Conference or demonstrate your solutions to hundreds of spectators by exhibiting in the Exhibit Hall during the Conference, January 7-10, 2019, in Washington, D.C.
Support the Institute — the industry’s leader and advocate for advancing building sciences and technology — in accomplishing its mission to improve the built environment. Play a significant role in uniting the building industry for productive collaborations. Facilitate the efficient exchange of ideas and solutions among all disciplines of building professionals. Enable the delivery of quality programming and educational sessions necessary for improving the industry. Be in the best position to reach and interact with the broadest audience of industry representatives. Take advantage of a variety of affordable opportunities to deliver your marketing message to the most diverse audience all at once. Establish relationships with industry leaders, stakeholders, government representatives, problem-solvers and users. Gain recognition from your logo and message in print, on signage, at the podium and in electronic communications. Qualify for free and discounted Conference registrations for you and your co-workers. Acquire access to the contact information of everyone attending the Conference. Support the industry and the Institute. Reserve your space now. Download the Prospectus. The National Institute of Building Sciences, ASTM International and RCI, Inc. issued a joint statement July 11 announcing their intent to avoid duplication of effort relating to their respective building enclosure commissioning (BECx) programs. The Institute is rolling out a series of new BECx certificate modules as an education component of an agreement with ASTM to create a joint certificate in building enclosure commissioning. Building on that, ASTM will work with the Institute to develop e-learning versions for each module. ASTM will leverage its expertise in multi-media services and provide access to the modules through its online learning management system. In addition, RCI Inc., in partnership with Professional Testing, Inc., is developing certifications for the various BECx roles as defined by ASTM. Read the release. 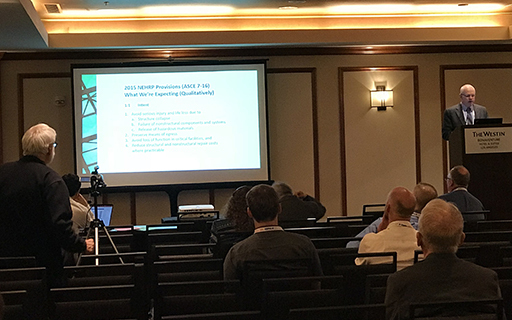 David Bonneville, Chair of the Provisions Update Committee, moderates a session about proposed changes to the NEHRP Provisions held during the 11th National Conference on Earthquake Engineering June 26th. The Building Seismic Safety Council (BSSC), with the support of the Federal Emergency Management Agency (FEMA), held a special session June 26th during the 11th National Conference on Earthquake Engineering (11NCEE). During the presentation, BSSC Provisions Update Committee (PUC) Chairman David Bonneville and BSSC Program Manager Jiqiu Yuan moderated a panel of speakers who reviewed the proposed changes related to seismic design requirements and seismic hazard maps for the National Earthquake Hazards Reduction Program (NEHRP) 2020 NEHRP Recommended Seismic Provisions. The panel speakers included PUC Members Nicolas Luco, Robert Pekelnicky, Satyendra Ghosh and Kelly Cobeen. Learn more about the 11NCEE session. A new publication is now available to offer buildings professionals a practical look at the future of the energy sector and the role of buildings. Building Our New Energy Future is a primer tailored to prepare buildings professionals for the challenges and opportunities of designing efficient and grid-responsive buildings within the changing energy sector. 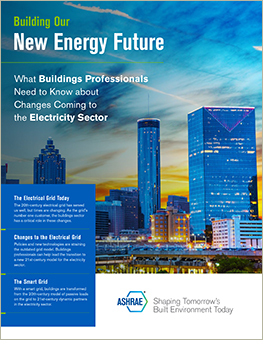 The resource was developed for ASHRAE, in collaboration with the American Institute of Architects (AIA), the National Institute of Building Sciences (NIBS) and the U.S. Department of Energy (DOE) National Renewable Energy Laboratory (NREL). Building Our New Energy Future provides strategies to communicate about prioritizing loads, storing versus using energy and advances in renewable energy. It also shares how new practice areas and business opportunities for building professionals will emerge in this drive toward a more sustainable built environment. Download the primer. 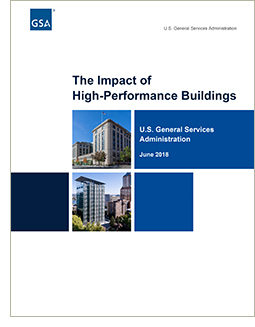 The U.S. General Services Administration has released a new study, The Impact of High-Performance Buildings, which finds high-performance buildings save energy, save water, cost less to operate, produce less waste and have more satisfied occupants compared with typical buildings. The Impact of High-Performance Buildings compares 100 GSA high-performance buildings to 100 GSA legacy stock buildings looking at actual performance data in five key metrics from the last three years. High-performance buildings are defined as those that meet the Guiding Principles for Sustainable Federal Buildings and legacy stock buildings are defined as those that do not. Compared to legacy stock buildings, GSA’s high-performance buildings have: 23% lower energy use, 28% lower water use, 23% lower building operating expenses, 9% less waste landfilled and higher overall tenant satisfaction. Energy and water savings are even greater when compared to industry benchmarks – 43% for energy and 35% for water. View the study. With support from the Department of Defense (DoD) Corrosion Policy and Oversight Office, the WBDG Whole Building Design Guide® has published new informational resources, guidance and an environmental severity classification tool to help facilities experts stay current on best practices in corrosion prevention and mitigation. The Doors Knowledge Page; the updated Cathodic Protection Knowledge Page; the updated Waterfront and Coastal Structures Knowledge Page; an updated CPC Source Introduction to DoD-sponsored training; and a summary of DoD and industry corrosion training opportunities for experts who design, build, repair and sustain military facilities. 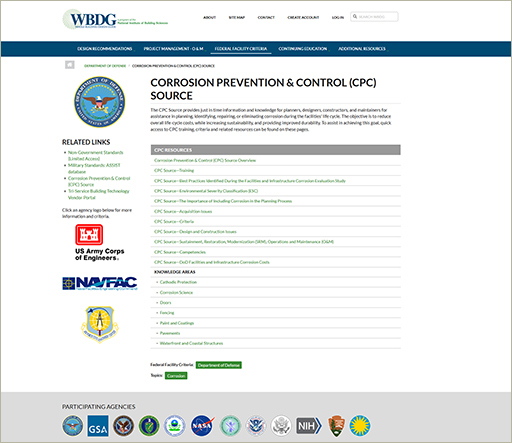 Visit the CPC Prevention & Control Source on the WBDG. To learn about an upcoming knowledge page focused on utilities and buried structures; eight new training modules; and the new Corrosivity Estimation Tool, read the DOD release.